San Diego Zoo animal care staff received two additional guests at the Conrad Prebys Elephant Care Center this month. The two Asian elephants were en route from the Woodland Park Zoo to the Oklahoma City Zoo but plans changed due to veterinary concerns. Female elephants Bamboo, 48, and Chai, 36, arrived at the San Diego Zoo early this month, and have been placed into quarantine while animal care staff evaluate their condition. 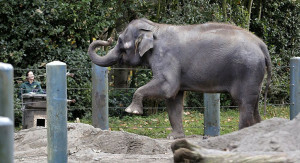 San Diego Zoo’s Elephant Care Center was opened in 2009 as a specialized care center for ailing and geriatric elephants. Over the last couple of years it has provided care to elephants from varied backgrounds and is currently home to seven elephants including both African and Asian species. Bringing species back from the brink of extinction is the goal of San Diego Zoo Global. As a leader in conservation, the work of San Diego Zoo Global includes onsite wildlife conservation efforts (representing both plants and animals) at the San Diego Zoo, the San Diego Zoo Safari Park, and San Diego Zoo Institute for Conservation Research, as well as international field programs on six continents. The work of these entities is made accessible to children through the San Diego Zoo Kids network reaching out through the internet and in children’s hospitals nationwide. The work of San Diego Zoo Global is made possible by the San Diego Zoo Global Wildlife Conservancy and is supported in part by the Foundation of San Diego Zoo Global. This entry was posted in Home Page, Home Page Slider, News and tagged Oklahoma City Zoo, San Diego Zoo, Woodland Park Zoo. Bookmark the permalink.